The wheels are turning on a variety of projects at MAB Corporation's NewQuay precinct, with their latest release racking up some impressive numbers. 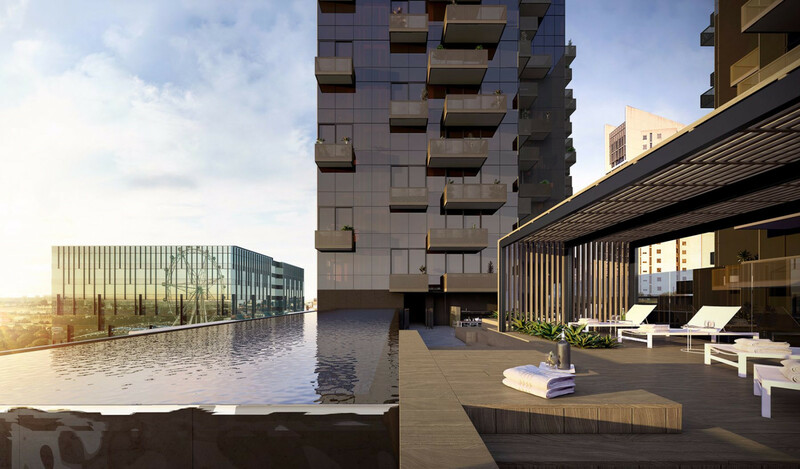 Urban Melbourne recently took the opportunity to interview MAB Corporation's General Manager of Residential, David Allt-Graham regarding their twin-towered Elm & Stone project, in addition to the company's plans for the balance of the site. Located at 395 Docklands Drive, Elm & Stone is the work of DKO Architecture. 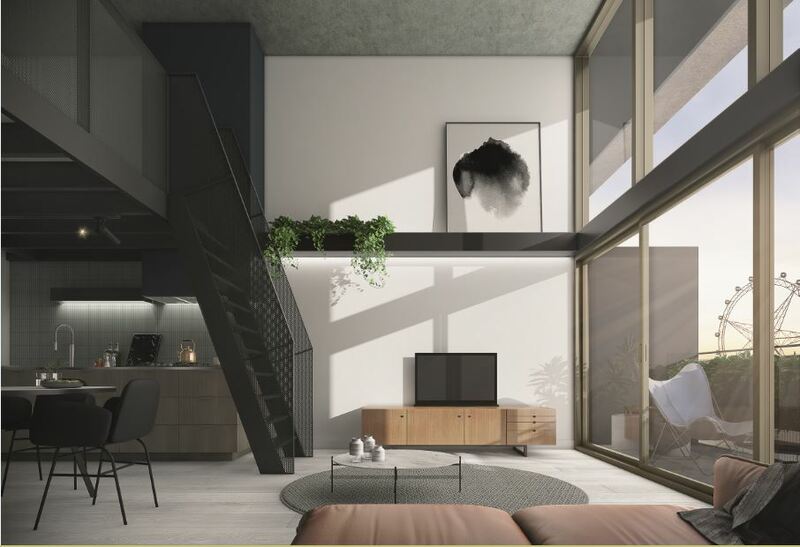 With a slant toward young professionals, Elm & Stone offers a selection of loft apartments in the heart of Docklands and has been designed to appeal/cater toward the needs of a younger generation. MAB Corporation will also develop 221 suites within the golden tinged towers for Ascott Limited and the Qatari Investment Authority, which will be operated under the Quest Apartment Hotels banner. Quest NewQuay is due to commence construction early next year and open during 2019. It will be the largest hotel in the Quest network, offering studio, one and two bedroom apartments, as well as facilities such as conference rooms, a business lounge, gymnasium and an outdoor terrace. Urban Melbourne: What features aside from the loft format define youthful preferences, and how are they applied to Elm & Stone? David Allt-Graham: Flexibility is the key to creating apartments that adjust to our evolving lifestyle. Young professionals want flexible spaces to suit a range of furniture sizes and configurations. Flexible interior colour palettes allow residents to use their imagination and create their own distinctive style. The interiors are contemporary yet timeless. They feature concrete ceilings, strip and track lighting creating ambience throughout, clever storage solutions and integrated appliances which enhance the minimalist and clean design. Planter boxes have been included on some balconies creating the ideal environment to grow herbs or add colour with floral arrangements. Bedrooms have additional Juliet balconies with sliding doors that can be opened to the morning sun and fresh harbour breeze. The amenities at Elm & Stone foster a sense of community for young residents, including a zen-garden, outdoor pool with barbeque and dining facilities, gymnasium as well as a ground floor lobby and library. Health and wellbeing is a major priority for younger buyers so it was a significant priority for MAB too. UM: Will hotelier Quest be occupying the southern or northern building, and will private residences and Quest guests use common facilities? What communal facilities are on offer? DA-G: Quest will be occupying the southern building, the serviced apartments will be completely separate from the private residences, including the entrances and communal facilities. A garden on level 4 with a water feature and plenty of plants such as Chinese Elm trees. This has been designed to be a passive space for residents to unwind, read a book or relax. On level 6 there is an outdoor pool deck and dining facilities (BBQ, tables etc), which is a more active space for residents where they can enjoy the uninterrupted northern sun. However, if residents wish to swim laps indoors, Elm & Stone will offer reciprocal rights to the development next door which will have an indoor pool (it is yet to be built). The ground floor lobby has a gymnasium, open staircase and a library. These visually-connected spaces aim to create a sense of activity and energy as soon as residents walk into the building. UM: What percentage of dwellings are dedicated to lofts and are they found over the building's lower levels? DA-G: Lofts occupy 22 percent of the building, and are located on the bottom six levels of the building, with 17 levels in total. UM: How has buyer interest/sales progressed to date and what colour scheme/options have proven most popular? DA-G: It has become a bit of a trademark of MAB to offer a selection of different schemes instead of the traditional ‘light’ and ‘dark’ options. Buyers appreciate having choice when it comes to style and interior design. At Elm & Stone, the Upper East Side theme has overwhelmingly been the most popular (80% of buyers). Upper East Side is fresh and breezy with a focus on natural light. It includes clean lines of white metal, timber joinery and gold metallic highlights. This palette is versatile, created to adapt to various current and future design trends. Buyers have also lent towards the Soho design, which is more sophisticated with darker tones, or Brooklyn, which is a bit more eclectic with stainless steel benchtops. Almost 40 percent of stock is sold. To date, we’ve sold 16 of the 31 lofts, all three townhouses and 36 of the 123 apartments. UM: What does MAB have planned for The Quarter? Will it remain commercial or are MAB exploring other uses? DA-G: The Quarter is still in planning, however MAB is currently working towards the site being a mixed commercial and retail site. MAB’s vision for NewQuay is to be a truly mixed-use precinct, one that people can live, work, shop and play; The Quarter will be an important addition in helping MAB to achieve this. UM: Banksia appears to be making good progress - when does MAB anticipate completion? DA-G: Banksia is tracking well and is on schedule for completion by the end of 2017 along with NewQuay Central Park. UM: Is there a general timeline for NewQuay West to begin and can any further info on the precinct be divulged? DA-G: We have submitted a Development Plan application for NewQuay West and will proceed with a planning application after the Development Plan is approved. The development of the Western Precinct has commenced with construction of the Ron Barassi Senior Reserve, and will be progressively developed until 2025. More details will be available once the Development Precinct is approved.